Oasis star Noel Gallagher was admitted to hospital after being pushed over during the band's set at the V Festival in Toronto, Canada on Sunday. According to the band's website, the star "fell heavily onto his monitor speakers". He may have fractured his rib and sustained ligament damage. The 41-year-old was playing guitar during a performance of Morning Glory when a stage invader pushed him over. Oasis have hinted that a gig on Tuesday may be cancelled as a result. Fans have been asked to keep checking the band's website for updates on the show, which is due to take place in London, Ontario. Gallagher's attacker was hauled to the ground by security guards. The guitarist's younger brother Liam, who was singing, had to be restrained from retaliating. The incident was captured on video by a fan in the audience and posted on the YouTube website. Oasis left the stage immediately after the attack, but the show resumed a few minutes later. 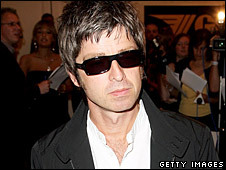 Gallagher's assailant was detained in police custody and will be charged with assault, according to the statement on Oasis' website. The festival gig came as the band prepare to complete their North American tour, which ends in New York on Friday. Gallagher has yet to comment on the incident on the blog which he has been updating throughout the tour.